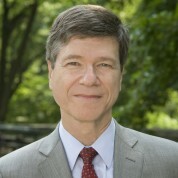 Professor Sachs serves as the Director of The Earth Institute, Quetelet Professor of Sustainable Development, and Professor of Health Policy and Management at Columbia University. He is Special Advisor to United Nations Secretary-General Ban Ki-moon on the Millennium Development Goals, having held the same position under former UN Secretary-General Kofi Annan. He is a Distinguished Fellow of the International Institute of Applied Systems Analysis in Laxenburg, Austria. Sachs is Director of the UN Sustainable Development Solutions Network under the auspices of UN Secretary-General Ban Ki-moon. Professor Sachs is widely considered to be one of the world’s leading experts on economic development, global macroeconomics, and the fight against poverty. His work on ending poverty, overcoming macroeconomic instability, promoting economic growth, fighting hunger and disease, and promoting sustainable environmental practices, has taken him to more than 125 countries with more than 90 percent of the world’s population. For more than thirty years he has advised dozens of heads of state and governments on economic strategy, in the Americas, Europe, Asia, Africa, and the Middle East. He was among the outside advisors to Pope John Paul II on the encyclical Centesimus Anns and in recent years has worked closely with the Pontifical Academy of Sciences and the Pontifical Academy of Social Sciences on the issues of sustainable development. Sachs is the recipient of many awards and honors, including the Blue Planet Prize, membership in the United States Institute of Medicine, the American Academy of Arts and Sciences, the Harvard Society of Fellows, and the Fellows of the World Econometric Society. He has received more than 20 honorary degrees, and many awards and honors around the world. Professor Sachs is also a frequent contributor to major publications such as the Financial Times of London, the International Herald Tribune, Scientific American, and Time magazine.